We are a community seeking to share God’s word and love with one another and those around us! We are members of the larger Archdiocese of Milwaukee community which includes nearly 200 parishes and more than 500,000 Catholics across 10 southeastern counties! Here in our own parish community, we have two groups serving as main advisory councils to the pastor, Pastoral and Finance, and from which branch all our committees and ministries. We invite you to spend some time here reading more about our councils, committees and ministries, looking over our full organizational chart, and if your called, becoming a member and getting involved in our wonderful community! 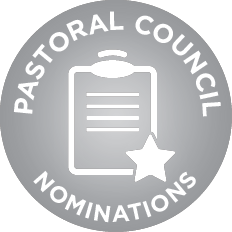 The Pastoral Council, serves as an advisory council to the pastor. Charged with helping fulfill the pastoral mission of Jesus and the Church, the Pastoral Council seeks to develop Catholic identity, promote evangelization, and foster stewardship within the parish. Members serve three-year terms. New council members are nominated and discerned onto the council on a rotating basis. If you have questions about serving or would like additional information, EMAIL Pastoral Council Chair Bill Rettko. As an advisory council to the pastor, the Finance Council prepares the budget, reviews financial statements, reviews regular audits, monitors the overall financial status of the parish and provides advice and guidance to the pastor in the administration of parish assets. In addition to the directors of administration and finance, the parish trustees and two liaisons from the Pastoral Council, at least two at-large parish members with accounting, financial, legal, banking, and/or administrative expertise are appointed by the pastor. If you are interested in serving on the Finance Council, contact Fr. Phillip Bogacki at 414-258-2604 or Finance Council Chair Paul Fisher at 414-305-7148 or EMAIL. The Christ King Pastoral Council is an advisory body that works in consultation with the pastor. The pastoral council assists the pastor in assessing parish pastoral needs, setting goals, and offering recommendations as Christ King Parish strives to become a community of intentional missionfocused disciples, evangelizers, and stewards. The Christ King Pastoral Council will discern 2 adult members. Each new member will serve a three-year term. Please consider nominating yourself or someone you think is interested in serving Christ King Parish in this capacity. Very Rev Phillip Bogacki Pastor, Pres.